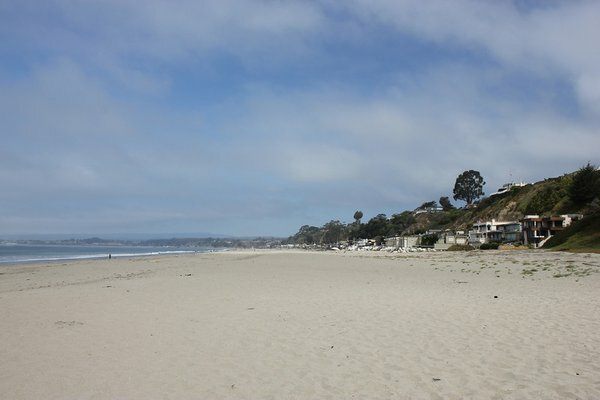 Platforms Beach is located between Rio del Mar Beach and Hidden Beach, and is accessed via a drive down Beach Drive from the Rio del Mar Beach Round-a-bout. There’s a state beach parking lot that requires that you either pay $10 to park or have a state park parking pass. There are some free parking spots around there, but they are limited and usually fill up before the paid spots do. Platforms Beach is known for its long, wide and sandy beach, with gentle waves and a long shelf out into the water before there is any drop-off – it’s like you are walking on a platform out into the water. It’s a very popular place for families. There is a public restroom and a water fountain, but that’s it for the amenities. If you’re coming from the Rio del Mar neighborhood, there’s a trail you can take from Seaview Drive down to the beach. Pot Belly Beach is located between Seacliff State Beach and New Brighton State Beach, on the border of Aptos and Capitola. The beach is partly privately owned (up to the high tide water mark, anyway), with a number of multi-million dollar homes built right up on the sand. As this is mostly a private beach, there are no amenities and most “users” of the beach are just passing through. However, Pot Belly Beach is also known as a good spot to learn to surf, away from the maddening crowds. If there is one image that identifies Aptos, California it would have to be that of The SS Palo Alto (the Cement Boat), the sunken concrete ship on the shore of Seacliff State Beach. A lot of people wonder how the ship got there – and it’s an interesting story. The ship was one of many concrete vessels built for World War I. Construction was completed in 1919, but too late to enter service in the war. The ship sat docked for 10 years in Oakland, before being bought by the Seacliff Amusement Corporation, which had big plans for it. The ship was brought to its present site and intentionally sunk, and then retrofit as an amusement ship with swimming pool, dance hall, and restaurant. The enterprise didn’t last long, as two years later the company went bankrupt. The ship originally had a large wooden superstructure which was removed and shipped to Texas. Eventually, several powerful winter storms cracked the ship, and it became unsafe, and has been closed to the public ever since. The SS Palo Alto is connected to the shore via a 500 foot long wooden pier, and every day of the year you can find groups of people fishing. A range of fish can be caught here, including a variety of perch, flounder, rockfish, salmon, and striped bass. In the State of California, anyone can fish off a pier without a license – so if you’re interested in giving fishing a try, this is one of the best spots to try it in Santa Cruz county. Admission to the pier and boat themselves are free. However, you must pay to drive your car into the Seacliff State Beach park. Alternatively, you can park at the top of the bluff outside the park and walk down for free. 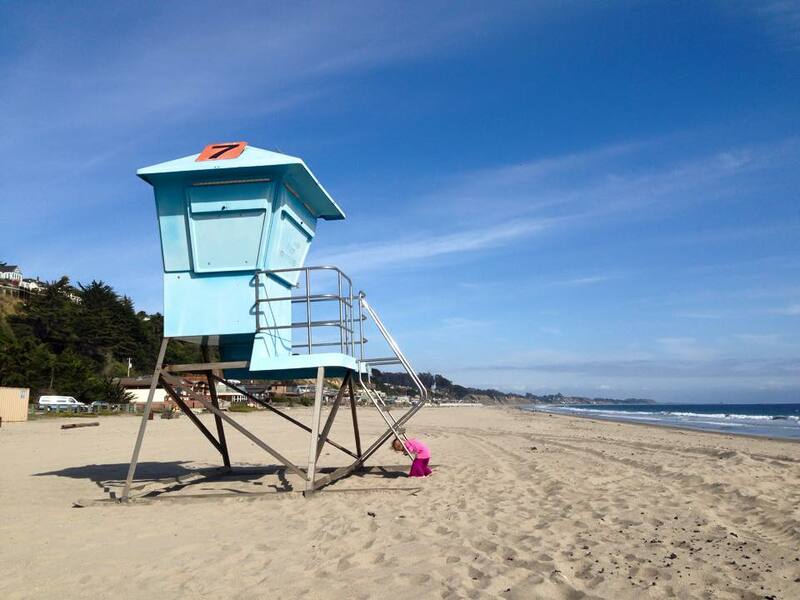 New Brighton State Beach is technically located in Capitola, however it is considered by many to be in Aptos, as the beach is directly connected to Pot Belly Beach and Seacliff State Beach, and not connected directly to the beach in Capitola. New Brighton Beach was formally known as China Beach, as during the 1870s and 1880s a community of Chinese fishermen made a home there from scrap lumber. By 1890, however, increasing anti-Chinese sentiment had forced the Chinese off teh beach. A plaque commemorating the location is located at the visitor parking lot. This is a very popular state beach, as it offers fantastic seaside camping. They have family campsites, group campsites, hiking trails, and RV sites with hookups. They also offer restrooms and showers, and of course a large beach area. They have campfire programs on Fridays and Saturdays at 7:30 PM during the high season.